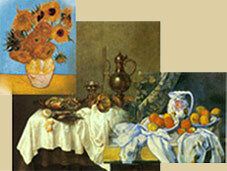 The earliest European still-life painting (1504) is usually attributed to Jacopo de' Barbari. In Western paintings, still life often appears as a minor feature of the design; but until the 17th century it was not generally painted for its own sake, although it was already traditional to Far Eastern art. The subject is particularly associated with northern European painting, and the choice of objects very often has a religious or literary significance: wine, water, and bread symbolizing the Passion; skulls, hourglasses, and candles, the transience of life; and selected flowers and fruits, the seasons. Flower painting, especially, held a spiritual and emotional meaning for Japanese artists and for 19th-century European painters, such as Odilon Redon, Paul Gauguin, and Vincent Van Gogh. Still life has been expressed in many different ways: Giuseppe Arcimboldo's witty arrangements of fruit, flowers, and vegetables made into fantastic allegorical heads and figures; the sensuous representation of food by Frans Snyders, Goya, and William Merritt Chase; the trompe l'oeil illusionism of François Desportes and William Harnett; the formal decoration of folk artists or primitives such as Henri Rousseau and Séraphine and of modern painters such as Matisse, Dufy, and Pat Caulfield; the semi-abstract designs of Picasso, Gris, and William Scott; and, probably at its highest level of expression, the majestic still lifes of Cezanne, Chardin, and Giorgio Morandi.